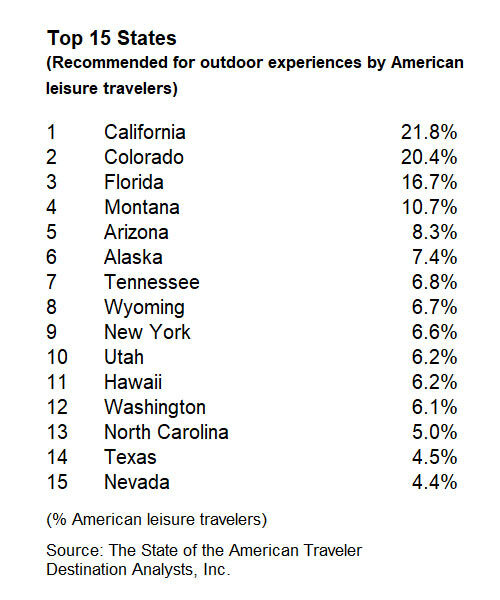 Americans love the great outdoors. Two out of three say experiencing nature (away from urban areas) is usually an important part of their leisure trips. Furthermore, over 40 percent say the idea of taking leisure trips focused primarily on being outdoors and experiencing nature is appealing. With this in mind, we look at which destinations are set to capitalize on this passion in 2019. No doubt about it—the winter days are upon us. Time to slow down, cozy up and dream of the tropics. What’s that? Humidity’s not for you? Right then—maybe the slopes. Saguaro and desert blooms? Mangroves and mossy trees? Amber waves of grain? Lucky for us, our beautiful country has it all. Here’s a list of the top states. Where would you recommend your friends go in 2019? Will you take your own advice? Wherever your greener pastures lie, take advantage of these extra-long winter nights to conjure the outdoor odyssey of your dreams.